Metro Transit is committed to engaging project partners and community members in transit decisions through its guiding principle of community orientation. The A Line project was led by a Project Management Team (PMT) comprised of staff from Metro Transit and key partner agencies. The work of these committees has concluded. This committee is made up of mayors, council members, county commissioners and other policy-level leaders from communities served by the eventual built-out rapid bus system. 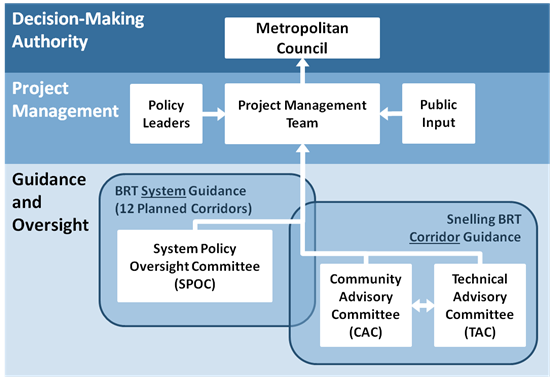 The SPOC provided advice to the Metropolitan Council on the design of the Metro Transit arterial BRT system. System-level decisions were made in 2013-2015 for the A Line project, but will also affect the eventual system of rapid bus lines. The TAC included staff representatives from Metro Transit, the Metropolitan Council, the cities of St. Paul, Falcon Heights, Minneapolis and Roseville; Ramsey County, Hennepin County and MnDOT. The TAC’s purpose was to review project plans and designs, provide technical guidance and assist in the resolution of technical issues in their field. Members represented interests of their respective agencies and provided guidance to the PMT on which project solutions were the most technically feasible. Throughout planning and design in 2013-2014, the TAC met bimonthly. TAC meeting materials are posted to Meetings and Events. The CAC was made up of members who represent residents, property owners, businesses organizations and employees of the project area, with diverse knowledge of the A Line corridor. Although the CAC did not have direct decision‐making authority, its meetings were a forum for discussion of issues with the intent of offering community insight to the PMT and the Metropolitan Council. The PMT valued the CAC's community perspective and considered the information provided by the CAC when it made recommendations to the Metropolitan Council. Download more information about CAC composition and purpose. Quarterly meetings were scheduled through 2013 and early 2014. CAC meeting materials are posted to Meetings and Events.